Massachusetts is a state that tops out lists when states are ranked by their educational outcomes. 24/7 Wall St. put it in spot No. 1 earlier this year. U.S. News placed it in third place for Pre-K-12. And the Nation's Report Card declared that the percentage of students in the state who performed at or above the NAEP proficient level was "greater than" most of the rest of the nation. Now the state is leading the way in personalized education. Less than a year after a new public-private consortium launched to "identify, analyze and promote" personalized learning practices, the group has published an analysis of its early results as a baseline for future assessments. The Massachusetts Personalized Learning Edtech (MAPLE) Consortium found that while traditional classroom practices still dominate most schools, some districts are blazing ahead. The biggest need? More time for embedded professional development for teachers. The study also saw gaps in technology readiness between schools that serve economically disadvantaged students and their more affluent peers. In urban districts, which have the highest proportions of low-income students in the state, only 12 percent of schools reported having sufficient devices to offer 24/7 learning experiences for everybody. Personalized learning, according to the LearnLaunch Institute, offers a customized instructional environment to address individual needs of students and their skills and interests. The intent is to better engage learners and meet the needs of "a diversity of students." LearnLaunch is a non-profit that advocates for education innovation, including the use of digital technologies to support and expand the use of personalized learning. The institute is working with the Massachusetts Department of Elementary and Secondary Education to host the MAPLE Consortium. According to "The Landscape Analysis on Personalized Learning in Massachusetts," three-quarters of responding schools "always" or "often" follow traditional instructional practice, providing "similar content at the same pace." 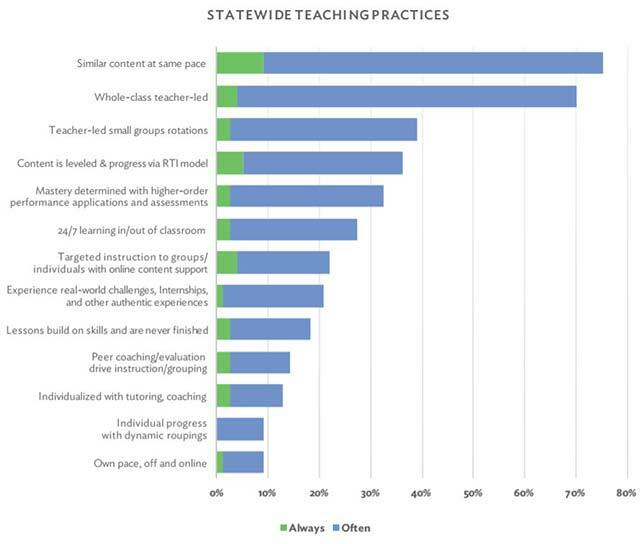 Percentages of districts in Massachusetts reporting on their teaching practices and student experiences. Source: MAPLE The Landscape Analysis on Personalized Learning in Massachusetts. Very few are using real-world challenges, peer or individualized coaching or dynamic grouping. Slightly more than 40 percent of respondents reported that teacher professional development is what would be "most helpful" in advancing personalized learning in their districts. Researchers found that "technical readiness" — sufficient WAN and LAN capacity and access to computing devices — was uneven across the state. While most districts (except those that are rural) have sufficient WAN and LAN coverage, only 16 percent of schools met all three criteria "to be deemed ready to scale personalized learning." MAPLE "Catalyst" districts as a group are most prepared — 90 percent have the tech they need to carry off personalized learning. Just half as many urban network districts and rural districts said the same — 49 percent in both cases. Catalyst districts are the ones identified by MAPLE as being committed to personalized learning and willing to share their experiences. "We believe our most important education priorities in the Commonwealth — early literacy, middle school mathematics, and innovative high school pathways — will require greater personalization of instruction," said Cliff Chuang, senior associate commissioner of education options for the state, in a prepared statement. "MAPLE's analysis will help give us a benchmark to measure our progress in the next few years." An executive summary of the full report is openly available for download on the LearnLaunch website. The full report is made available within 24 hours of registering for it on the same site.